I have come to appreciate sleep as being one of the most valuable currencies in the economy of parenthood. It is for that reason that parents will take any advice, no matter how nonsensical, if it promises consistent sleep from their infants. 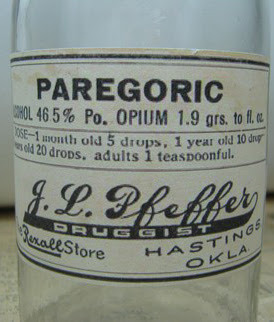 Up until the late 1960’s, many parents utilized the magical over-the-counter concoction known as “paregoric” to calm fussy or sleepless babies. Of course, that was before society frowned on administering opium to newborns so now we are forced to read books that offer comprehensive behavioral solutions. Thanks big brother. There are some who believe the key to consistent and predictable infant sleep patterns lies in unyielding regimentation. Each and every nap, meal, and bowel movement will governed by a strict schedule that cannot be altered for several weeks lest the spell be broken. Consequences of breaking the routine can include anything from insomnia to unsanctioned defecation. Those with the personal fortitude to dedicate to such a system have reported some rather impressive results. Another school of thought teaches that the parent’s job is not to force the child into a regimen, but to learn the child’s patterns. Each and every child is an individual and if he or she feels the need to wake up screaming every half hour; we should be honored to have the opportunity to become acquainted with their energy. Unnecessary structure only serves to stifle creativity. As with most philosophies, I believe there is wisdom in compromise and moderation. While I may find the “and a child shall lead them” approach somewhat eye-roll inducing, there is also little chance that I am going to choke down my sandwich because little Timmy’s nap-time might be delayed by 45 seconds. My wife and I have adopted a middle-of-the-road approach that seeks to provide the benefits of structure with the practicality of being able to urinate at will. It seems to have worked fairly well and for the longest time it was not his inability to sleep that was infuriating, it was his ability to sleep anywhere but in his crib. He effortlessly nods off during a monster truck rally only to be startled awake later that evening when someone dropped a sock on the carpet. It appeared that the easiest way to awaken him was to gently place him on a Sealy Posturepedic Infant mattress in a darkened room. We then inundated his room with noise conditioning devices. At one point his tiny little ears were being assailed by a white noise machine, an in-utero heartbeat provided by a stuffed animal, and an MP3 loop of “Moonlight Sonata.” Thank goodness my wife is smarter (and more patient) than I am since he would still be waking up every two hours and I would be attempting to soothe him with game calls and the soundtrack to Apocalypse Now. The drug of choice for parents in the old days ! !